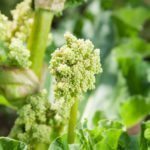 Why is my rhubarb going to seed? It's a big green ball on it. 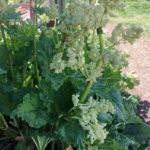 Rhubarb bolts (flowers) normally due to stress, be it from lack of water or heat or damage. Given the unusually warm temps this spring in many parts of the country, I would guess that heat is why it is bolting. They are also more prone to bolting when they are older. If your clump is a few years old, you may want to divide it to help rejuvenate it and reduce the chances it will bolt.